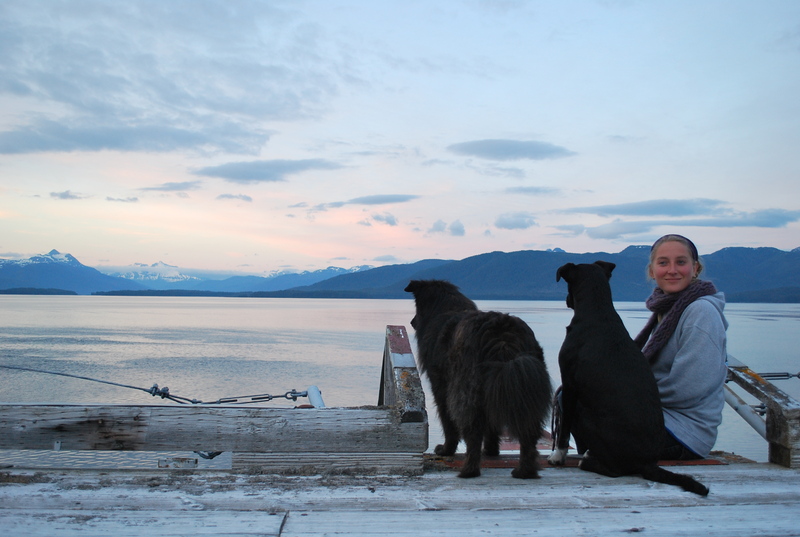 My master’s research was aptly titled “The Rapunzel Project” after our four woman field team wrapped up our 2011 field season from the Five Finger Lighthouse in Frederick Sound, Alaska. Throughout the summers of 2011 and 2012 I supervised a rotating team of undergraduates, training them to collect data on humpback whales (Megaptera Novaeangliae) from the lighthouse research station with the aim of investigating communication on a North Pacific foraging grounds. The Rapunzel Project utilized a theodolite to monitor humpback whale distribution and social behavior across Fredrick Sound from the 18.3 meter tower which dominates the island skyline. From this vantage point we were able to map with fine precision where in space and time both whales and vessels were located, where they were traveling, and how they were oriented relative one another. With a hydrophone in the water we were able to monitor how humpback whale dispersion correlates with the sounds generated below. The lighthouse vantage point allowed us to observe humpback whale behavior without inundating the soundscape with research related vessel noise. This effectively allowed us to ‘control’ for quiet periods of observation when vessels were not present in the area and when humpback whales could be acoustically detected most effectively. The lighthouse also afforded us a land-based research station which is less vulnerable to inclement weather and was logistically much simpler than a vessel-based operation. The initial goal of the project was to test for an impact of vessel noise on humpback whale non-song vocal behavior, a goal I continue to pursue in my PhD research. What the Rapunzel Project resulted in was the collection, classification, and description of humpback whale non-song vocalizations and a deeper understanding how vocal behavior varies based on social/spatial context. Notably, many students were trained, and relationships were built within the structure of the Rapunzel Project internship program. My dissertation research is founded on the insights gained through the Rapunzel Project academically and personally, and based on the success of bringing students into the field in 2011 and 2012 interns will again feature prominently in upcoming fieldwork. My field seasons at the lighthouse have ended and after a two long years of data processing and analysis our results are now submitted for publication. Take a look around the Rapunzel Project pages and posts for more information of what life at the lighthouse was like and who our 2011 & 2012 research teams were!